Stanford Orson Cazier was an educator and university administrator serving as president at two universities. He was a scholar on the Utah War, military history, and Mormon history. He helped form the Mormon History Association and sat on the editorial boards of Dialogue: A Journal of Mormon Thought and BYU Studies. Cazier was born in Nephi, Utah, on June 11, 1930. He was a member of The Church of Jesus Christ of Latter-day Saints. He served briefly in the United States Navy as an Ensign (1952–1953). He earned his bachelor’s and master’s degrees from the University of Utah and his PhD in history from the University of Wisconsin. He taught for a time at the Bronx Community College. He was a professor of history at Utah State University receiving the distinction of Teacher of the Year in 1966. The following year, he was awarded a Ford Foundation Fellowship by the Academic Administration of New York University. He served as an administrative intern and assistant to the president of New York University. Cazier served as president of both California State University, Chico (1971–1979) and Utah State University (1979–1992). He also served as assistant to the president and vice-provost at USU. While serving as president of Chico State College, he brought it into the California State University system and it was renamed California State University, Chico. He served during a difficult time while the university was recovering from the political unrest of the 1960s and the state budget crisis. 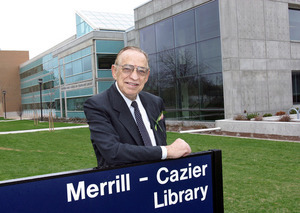 While at USU, the Merrill-Cazier Library was named in his honor. He retired in 1992, but continued as a professor there until 1997. He taught occasionally afterwards as a professor emeritus. He experienced a series of personal tragedies in 1998-1999. His wife Shirley contracted Parkinson’s disease and dementia and died in 1999. Their son Paul developed a fatal brain cancer and died, and Cazier’s sister died in a tragic car accident. Cazier was accused of leaving USU $3 million in debt and after an altercation with his accuser he was banned from campus. Cazier gradually rebuilt his life through serving in the community by driving for Meals on Wheels, reading at a local nursing home, and teaching ESL students. He and his wife Shirley were married on his birthday in 1952. They were parents of four sons. Cazier passed away March 14, 2013. This page was last edited on 24 November 2014, at 16:13.